Fall foliage in the Finger Lakes region inspired many communities to celebrate with festivals and special events. There are many great ways to view spectacular colors of the leaves and festivals offer some of the best opportunities. Bristol Mountain Fall Festival: View the fall foliage, participate in game competitions, sample craft booths, unique foods, and more. 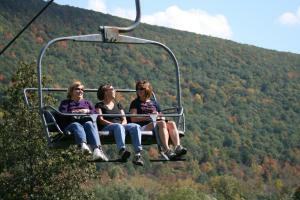 Be sure to take the chair lift, or hike, up the mountain for a great view of the fall colors. Bristol Mountain&apos;s Fall Festival takes place the second Sunday in October near Canandaigua at the base of Bristol Mountain Winter Resort. Naples Grape Festival: Come and sample everything "grape," including Finger Lakes wines and of course, grape pies. Last weekend of September in Naples. KettleFest: This Victor farm produces maple products, honey, and mushrooms, and hosts a one-day celebration of sustainability and live music in mid-September. Read below to see fall events in Ontario County&apos;s Finger Lakes. 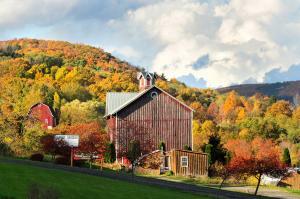 Or, to see more fall foliage events and information from all over New York State, click here.